LINCOLN, Neb. 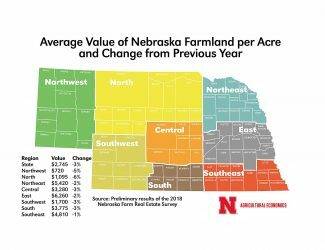 — The average for Nebraska agricultural land values has declined by 3 percent over the last year, according to preliminary findings from the University of Nebraska-Lincoln Farm Real Estate Market Survey. This marks the fourth-consecutive year of decline. Market values have dropped 17 percent since reaching a high of $3,315 in 2014. The statewide all-land average value for the year ending Feb. 1 averaged $2,745 per acre. 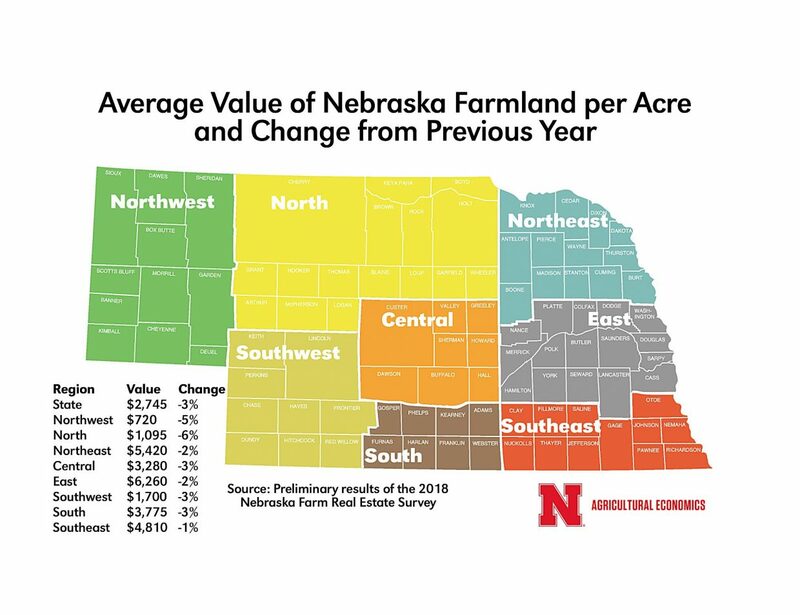 Average farmland values for the eight districts and the percentage decrease from 2017 were: northwest, $720 (5 percent); north, $1,095 (6 percent); northeast, $5,420 (2 percent); central, $3,280 (3 percent); east, $6,260 (2 percent); southwest, $1,700 (3 percent); south, $3,775 (3 percent); and southeast, $4,810 (1 percent). Survey participants pointed to low commodity prices over the prior year and current property tax policies as the reason for declining farm real estate values. Tillable grazing land values declined by 6 percent, the largest percentage decline of the seven land classes. Sharp drops in the northeast (11 percent) and central (10 percent) districts contributed to the overall reduction in tillable grazing land values. Hayland in the central and southwest districts also experienced 10 percent declines in value. Values for dryland and irrigated cropland across Nebraska declined 1 to 7 percent. Several districts exist where regional land values increased 2 to 6 percent, but these instances were small, indicating a fairly unchanged land market for this region. Future prospects for cropland in Nebraska remain interlaced with the earning potential for the major commodities grown across the state, input expenses and monetary policies influencing the cost of borrowing for future land purchases. Regulation policies guiding the use of water for irrigation were also noted as a potential driver for the changes in the future value of irrigated cropland in certain areas of the state, according to survey participants. Land classes serving the cow-calf industry, including grazing land and hayland, experienced a wide range in declines between 1 and 10 percent across the state. According to a survey of participants, demand for beef and availability of forages during periods of drought were two of the major drivers for the future value of these land classes. Recent increases in exports of beef from Nebraska to China remain critical for the value of cattle raised in the state. Irrigated cropland rental rates on average declined between 2 and 5 percent across Nebraska with a small increase noted in the north district. Survey participants indicated that property taxes are one of the landowners' most critical concerns during rental negotiations. Landlords face the prospects of low returns on their land after accounting for property taxes, while tenants face tight cash flows with current commodity prices, input expenses and rental payments. Annual maintenance of fence, weed control, removal of unwanted brush or cedar trees, and watering systems for livestock also factor into the rental rates paid across Nebraska for grazing land.